What It Is: Summer’s on the horizon, which hopefully means weekends spent by the pool or on the sandy shores for a bunch of you. 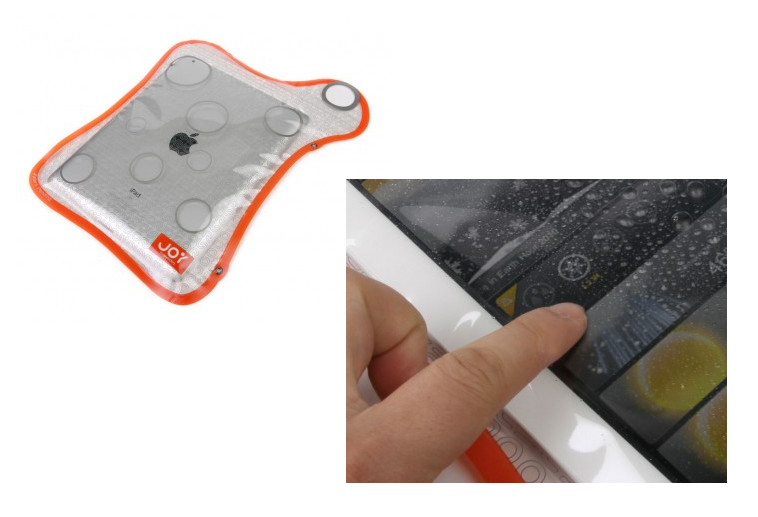 If you happen to be the lucky owner of an iPad-type device but are terrified of using it within splashing distance, the BubbleShield may be just the ticket. This reusable, waterproof satchel pulls double duty: it protects your precious device from everything from water to pizza sauce to daily grime AND it still allows you to USE your iPad; keeping it blissfully smudge & fingerprint-free. You can even still use core functions like photography and video recording with no interference from your handy protection bag. Who It’s For: To put it bluntly: anyone that loves toting their electronics around, but hates the risk that comes with it (or perhaps more accurately, hasn’t learned from past blunders). Particularly useful if you’re splurging on an iPad for a teen or adult that’s particularly accident-prone or careless. What It Costs: $21.95 for a three-pack. Where It’s At: Unfortunately shipping from the manufacturer website is quite cost-prohibitive (they also sell similar cases for iPhones / other Smartphones), but you can order from Macinbag. Spice Hunters bonus entry opportunity: I’m curious – what kind of ‘Smart’ devices do you have? A Kindle or Kobo? An iPhone or Galaxy? An iPad? Something else? Tell me in the comments below and while you’re at it – what do you think of the BubbleShield? I have a PC, an ipod nano, a point and shoot finepix camera, a SpareOnePlus Emergency Mobile Phone, an ETON American Red Cross Emergency Radio and a Sony e-reader. All I have is a laptop and cellphone but the kids and grandkids have pretty mush everything. I think this may be a great gift for the grandkids who have regularly have messy screens. I own a Kobo and an Iphone, and Ipad. I think the sheild would be great to take to the beach, and maybe even use in bath tub or hot tub. I have an ipad & I think the Bubble Shield is a great idea. It’s very reasonably priced as well. At the moment I own a Blackberry (but don’t use it), so the only Smart device I use is my Sony e-reader. And I read it in the bath (I like to live dangerously), so this Bubble Shield would be most useful. Spice Hunters extra entry- I hate to say it but I don’t use any smart devices whatever. But I think the Bubble Shield is a great idea for a few people I know. Spice Hunters extra entry – I have a Samsung Galaxy S and a Kobo reader (bought with thought by my kids since I am an avid reader) however I do much prefer a book in my hands. Not sure I like the bubble wrap – could be useful on the beach, can’t imagine using it in the bath. Spice hunters extra entry – I have an ipad and a blackberry. This bubble shield is a fantastic idea for all of us who have to have a cup of tea/coffee in our hands and spill frequently. I just have a smartphone! I would love this! I can’t believe you can still use it in the shield!! I have a Blackberry. The bubble shield might be a great idea for a younger person but I don’t see me having any use for one. I think the Bubbleshield is a great idea for anyone near water. I would certainly think it would be great for young adults just getting used to caring for an electronic device. My only device is a Kobo reader. I have a MacBook Pro and I love the Bubbleshield. Spice Hunters bonus entry: I only recently cracked open my Samsung smartphone ‘cos I needed a device to access the internet while traveling & I didn’t want to risk getting my work laptop stolen. I’ve come to enjoy surfing & playing games on my phone. I think the BubbleShield is a great idea. I have a tablet that I have not wet up because I do not have WiFi.